This slide presentation was produced under Cooperative Agreement DTFH61- 99-X-00063 between the Federal Highway Administration and the Silica Fume Association. This document is disseminated under the sponsorship of the Department of Transportation in the interest of information exchange. The United States Government assumes no liability for its contents or use thereof. The contents of this report reflect the views of the author who is responsible for the facts and the accuracy of the data presented herein. The contents do not necessarily reflect the official views or policies of the Federal Highway Administration. This document does not constitute a standard, specification, or regulation. Trade or manufacturers' names that appear herein are cited only because they are considered essential to the objectives of the document. The Federal Highway Administration does not endorse products or manufacturers. The Silica Fume Association was formed in 1998 to serve as a voice for producers of silica fume. 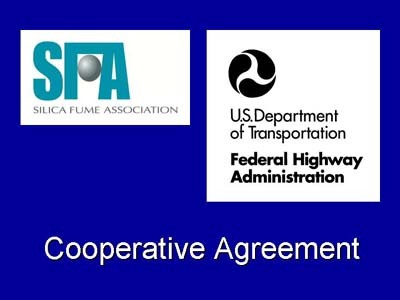 Please visit the SFA web site (www.silicafume.org) for information on additional products produced under this cooperative agreement.